– A world championship sand volleyball tournament! How random and exciting! We got to watch two time US Olympic champions Misty May-Treanor and Kerri Walsh defeat a Czech-Republic team. – An attempt to attend a Lutheran mass. The sanctuary was roped off half way up the aisle to keep tourists back. The pastor mentioned that English speakers were welcome to partake in the service but that tourists were to stop any “tourist activities”. We assumed that once mass started we would be allowed up front to sit with the locals. However, the guard at the rope would not let us through. Matt finally asked the man for a worship pamphlet, or help finding the correct hymn, but was just turned away. What a strange experience to be welcomed to worship only to be spectators. – Museums where we learned all about the local maritime history, Norway’s role in the oil industry, moose, and sardines. – A day trip to Preikestolen, a strange rock formation that juts out over the Lysefjord. 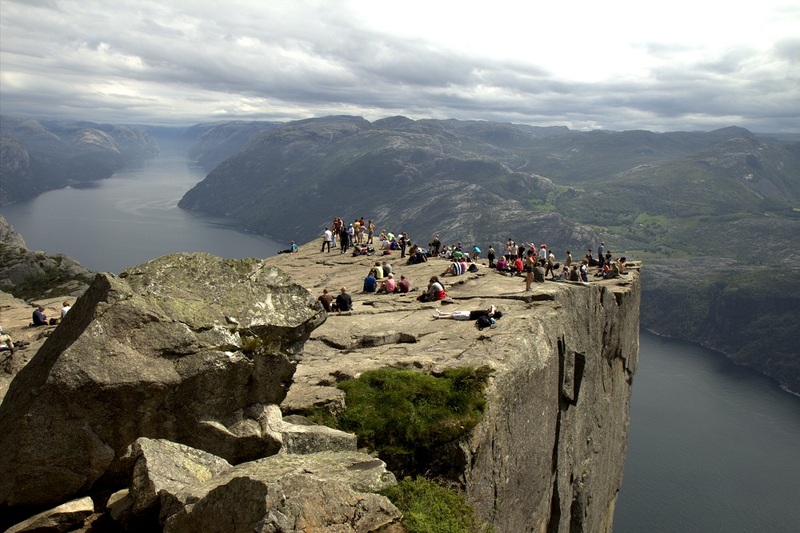 Preikestolen, also known as Pulpit Rock, has no guard rails along the side, like it would in the US. You could walk right up to the edge, have a seat, and hang your legs over the side. Norwegians claim that no accidental deaths have occurred here, but that was difficult to believe with the endless stream of people that come through. The sun came out (Hallelujah!) and we basked as we took in the view of the beautiful Lysefjord. See the photos! Written by: kate on July 2, 2011.on November 27, 2011. I must admit that in a tourist town, Norwegians, who are solitary people, can understandably let their Norwegian Stinking Thinking get in the way. Although this IS very disappointing, I must say that in any small town, this would not have happened. It shouldn’t have happened here anyway, but I can see how English-speakers can be intimidating and they can therefore shut them out. Oh and, yeah, the rumor about Preikestolen is true! Accidental deaths are at a count of zero. Hey Leah! Thanks for posting! “Norwegian Stinking Thinking” – did you come up with that yourself? Yeah, I’m guessing the tourism at this church also kept it from being welcoming.